As your wedding photographers, we strive to narrate the story of your wedding day in the most compelling way, and the wedding album is an extension of that story. 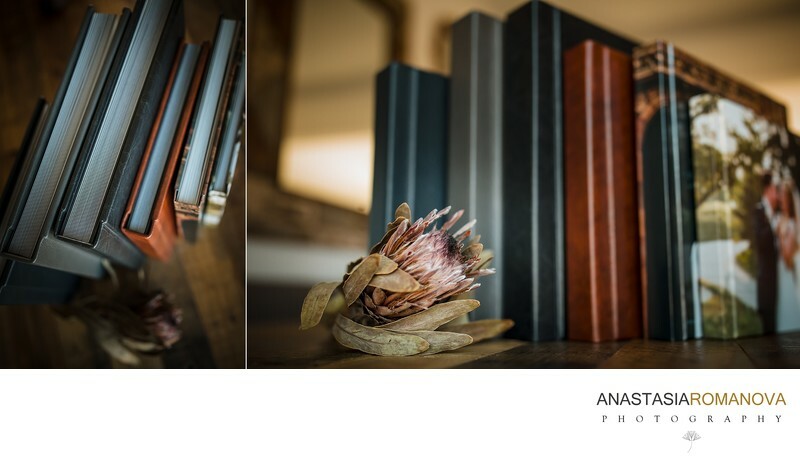 Although it is common to store your images on your computer or USB, there is no comparison to seeing your photos come to life in a beautiful book. We are firm believers in printed imagery because it is a tangible memory from your special day that you can enjoy over and over again. We pride ourselves in offering you a gorgeous finished product that will stand the test of time. Your wedding album will be a valued family heirloom that is proudly showcased in your home and treasured by generations to come. Our wedding albums include 40 pages which makes 20 spreads and come in 8x8, 10x10 and 12x12 sizes. A spread is two pages opened out. Once your proof gallery is available online, you can start selecting the images you would like to be included in your wedding book. The number of images that an album can fit depends on its size. For example, 12X12 album can include up to 85 photographs and a smaller 8X8 one will fit up to 50. The initial draft of your album design will be shared through the online slideshow where you can flip through the pages and leave your comments below each spread. Easy! Parent albums come in 8x8 and 10x10 sizes and include 30 pages. These albums can be a replica of the bride and groom’s album or custom designed to your liking. You or your parents can make their own selection for parent books and there is no extra charge for having them customized. The parent albums come in our signature Portrait Book finish. 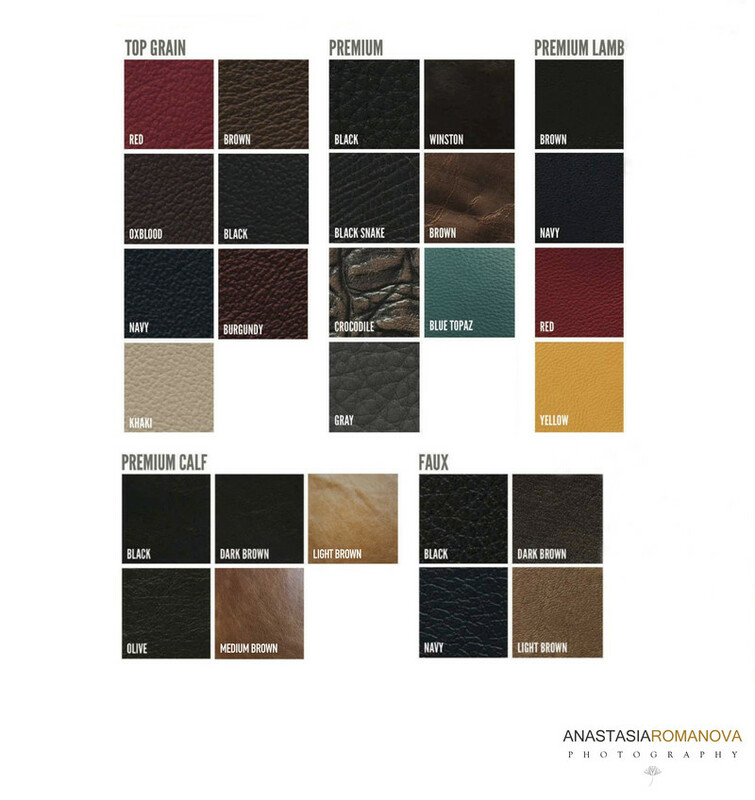 You can also have the parent album upgraded to the leather option if you wish. All of our bride & groom and parent albums come in a gorgeous black presentation box which is a great secure storage option for your book. Along with the online gallery, you will receive a beautiful custom USB drive where all of your wedding photos will be stored. 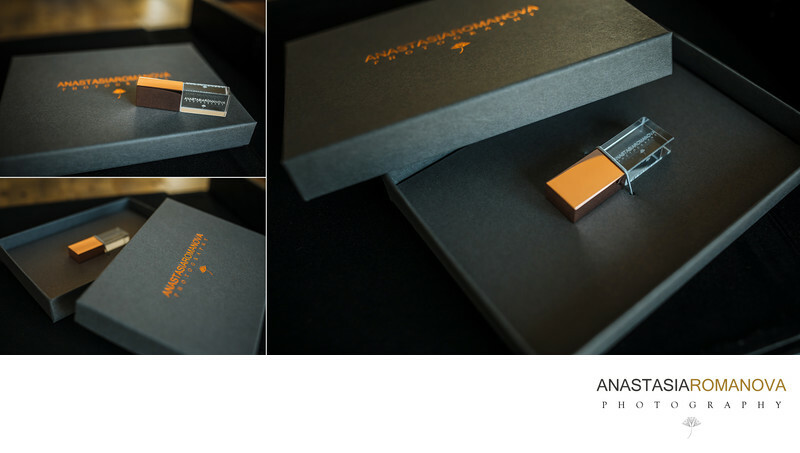 The USB drives are included in all of our wedding coverage packages and custom wedding collections. There are also a few different imprinting font options for you to choose from. The price of the albums varies based on its size, number of pages and cover options. The albums are presented both through our a la carte menu where you can choose what album(s) you would like to add to your wedding day coverage, as well as being a part of all of our predesigned wedding collections. If you decide to invest in your album prior the wedding, the cost will be locked in your contract. You also have an option to order your album at any time after the wedding as well, but at the studio's current pricing.